← Science? Please, I’m Republican! Your presidency is failing. I voted for you, as did millions of others, because we thought you could arrest our country’s precipitous decline. America desperately needed change when you came into office – we were bleeding economically, losing our credibility internationally and spending our money and sacrificing our men on the most pointless and ineptly run war. Now we are stuck in a hopelessly deadlocked debate on our budget and on how to manage our burgeoning debt. It is not an honest debate, Mr. President. It is being driven by special interests and ideology. The Republicans do not want a solution, they want power. They want you to fail. But you have been strangely ineffective. You seem desperate for compromise, for debate and consensus before we move anywhere. And you are being eaten alive. The same thing happened on Healthcare Reform. You did not lead, instead you started a debate and thought the best ideas would emerge and be adopted. The other side realizes that in Politics perception is reality and they have shamelessly trumpeted lies and prevailed. Truth is not self-evident, Mr. President – you have to communicate it. Even blatant lies, when marketed by skillful, well-funded zealots become accepted truth. Have you not seen the egregious examples of these: that you were born abroad, that you are a muslim, that you are communist, corrupt, evil Kenyan seed, an Anti-American foreign agent, yada, yada, yada? People are willing to trumpet these lies because they see you as weak, not willing to fight and because by delegitimizing you they can feather their ambitions and their pockets. Now they are demagoging you on the Federal Debt. Once again you have not led and they are getting away with laying down the law. And with astonishingly bold lies. And what do you do? 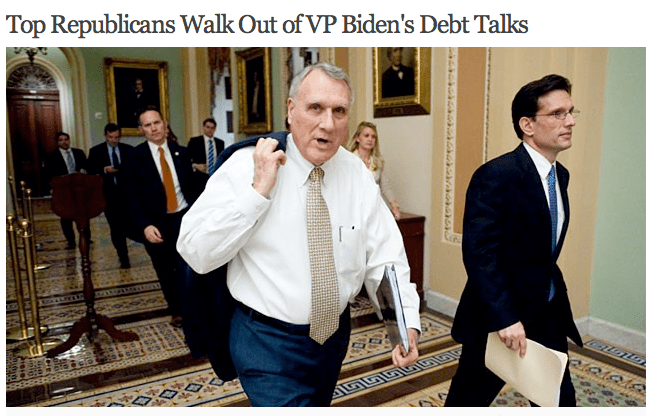 Set up endless debates to forge “consensus” like the so called bipartisan “Budget Ceiling Talks” (with VP Biden presiding). This is not leadership and cannot achieve anything. The talks have predictably failed. Stop debating, Mr. President! There is a perfectly reasonable solution that a bi-partisan commission that you set up came up with. Yes, you set it up. It was your idea and they came up with eye-popping, sensible recommendations to fix the budget mess. 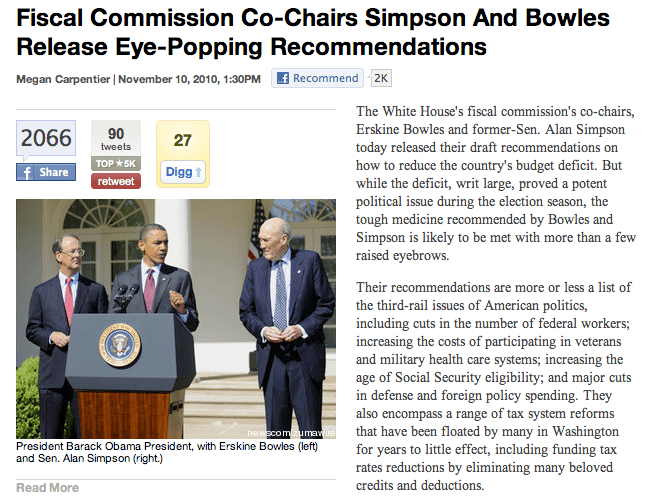 I’m talking about the Fiscal Commission chaired by Erskine Bowles (Dem) and Alan Simpson (Rep). See here for details of what they came up with. The Commissions recommendations are bold and sweeping and utterly sensible. They spare no one. They suggest reforming: defense, favorite tax subsidies for corporations, tax loopholes, social security, entitlements, discretionary spending etc in a responsible and workable way. Just the way you had instructed them to do. The recommendations are truly bipartisan – they cause some pain on both sides of the aisle. And if these recommendations are adopted we will see our deficit shrink to 2.5% of GDP in 8 years, better than any other proposal on the table, including Paul Ryan’s hatchet job. It will make our deficit the second smallest of all industrialized nations! So I’m perplexed, Mr. President. Why haven’t you pushed this? It was your idea. You could take well deserved political credit for it and it fit with your desire to reduce partisanship. It is a solution embraced by all neutral observers, economists and pundits. Mr. President, this is what you must do. End the endless bickering right now. Let’s not cherry pick ideas and debate them to death. Let’s not talk about Corporate Jet subsidies and punishing oil companies or billionaires in isolation. 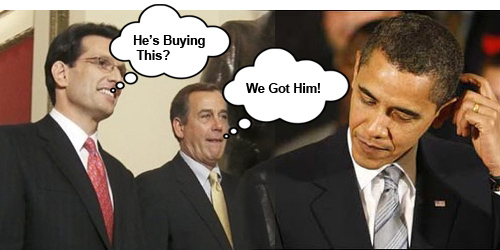 Let’s not create even more dug-in positions and a dangerous game of chicken with our debt ceiling. All you have to do is get solidly behind your own bipartisan Commission’s plan. Use your wonderful gift of communication to convey its benefits and common sense to the American people, to your party naysayers and to the Republican ideologues. Announce that there is no room for unbundling and discussing the package’s recommendations in isolation. There is shared pain here but it is a minimal pain solution to our dire debt problem. You will have solved the hardest problem this country faces. This entry was posted in Money, Uncategorized. Bookmark the permalink. During the campaign, Obama was energizing. His oratory was spot on, his speeches inspiring. I, too, voted for him hoping to see some of that communication skill put to good use in the White House. I have been astonished that it has not! Your blog is beautifully put — I hope Obama reads it and takes it to heart. Thanks for your comment. It is astonishing that on something as important as the federal budget Obama has failed to firmly define what we should do. He set up a great bipartisan commission and they came up with great recommendations. He could claim victory. Why keep debating? He can only lose now.